SimpleD Budget - Watching your pennies is more important than ever ~ Android Forever! 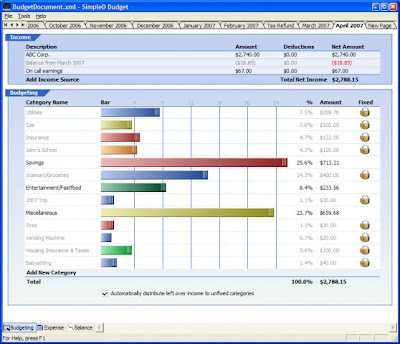 "SimpleD Budget is an open source Windows application designed for personal or household financial management. With SimpleD Budget, you can keep track of your expenses for each month by allocating your income into "categories" such as Mortgage, Entertainment, etc., and as you spend money throughout the month, you enter the amount into a category. SimpleD Budget will let you see how much you have left in each category, or see how fast you are spending. It supports multiple languages(Unicode) and multiple currencies."